They are called internet "trolls". They are not the type of trolls with pug noses, long frizzy hair, and no clothes, nor are they the ones who live under bridges and like to eat goats. These are those people who come into a comment section of a website to be abusive or unpleasant, uncivil, and really fractious in a debate. They do this either to use the comment section as their own soap box for something they want to promote, whether or not it is relevant to the article, or simply for the enjoyment of getting other people riled. They are called trolls because if a person were to follow their comment history, it becomes obvious that they do not favor any particular web site content, but are scattered throughout the internet saying the same things regardless of that web site’s content or purpose, and who, on any web site upon which they make comments, employ name calling and cute games of personal attack. One of the (assumed) unintended consequences of this behavior is that readers of those comments actually come to misunderstand the gist of the original article. There may be some making relevant comments repeatedly in a debate forum who get frustrated enough to slowly resort to personal attacks, but trolls enter a thread making personal insults. Popular Science’s web site is one of many which has eliminated the comments sections at the ends of articles, and for scientific reasons. As they put it, “comments can be bad for science”. Although they acknowledge that most comments had been “delightful and thought-provoking”, a “fractious minority wields enough power to skew a reader's perception of a story, recent research suggests”. A study led by University of Wisconsin-Madison professor Dominique Brossard had 1,183 Americans read a fake blog post on nanotechnology and then reveal in survey questions how they felt about the subject. Through a randomly assigned condition, they then read either epithet- and insult-laden comments that attacked the person making a comment while not addressing the topic or making any civil comments, or well reasoned comments discussing the topic. .
“Uncivil comments not only polarized readers, but they often changed a participant's interpretation of the news story itself." "In the civil group, those who initially did or did not support the technology — whom we identified with preliminary survey questions — continued to feel the same way after reading the comments. Those exposed to rude comments, however, ended up with a much more polarized understanding of the risks connected with the technology. Simply including an ad hominem attack in a reader comment was enough to make study participants think the downside of the reported technology was greater than they'd previously thought”. Another study found that just firmly worded (but not uncivil) disagreements between commenters impacted readers' perception of science. According to Popular Science, since “commenters shape public opinion; public opinion shapes public policy; public policy shapes how and whether and what research gets funded--you start to see why we feel compelled to hit the "off" switch." The same holds true with political articles. There are too many people who, while actually sitting at a computer reading a comment will accept what is said without checking to see if the comment is opinion, a reprinting of something read on the net, a rehash of someone else’s posting, or purposely fictitious, when they could easily use that same computer to check the veracity of the content of the comment. Aiding in the troll attacks, name calling, and presenting misinformation is the anonymity allowed by pseudonyms on the net. Hiding behind a false identity, a person can say anything without the need to be responsible. Your next door neighbor, with whom you are the best of friends, could be the person who says the worst things about you in post-article comments without you knowing it is he, while he does not know it is you he is insulting. This also allows people to make comments whether or not they truly believe what they post. Popular Science found that a politically motivated, decades-long war on expertise has eroded the popular consensus on a wide variety of scientifically validated topics such as evolution and climate change. In some cases, establish science suddenly becomes a topic of debate among non-scientists who then elect people to policy making positions who agree with them. Just as everyone seems to be a Biblical scholar, the internet has made people feel they are experts on most scientific topics. These non-science and ill-informed attitudes began to enter into the comments section of a science publication devoted to championing science, and the decision to close comments was made. Since I have friends from both ends of the political spectrum I often receive Facebook posts and emailed articles that cover the full spectrum as well. And I compare and cross reference before I write anything. Often someone posts a comment that is based on something that has been debunked or refined, which shows that the commenter has simply repeated something with which they agree. At times it is obvious that people have investigated beyond their comfort zone, while others are just parroting the comfortable. And then there are those who simply make comments about people who have offered their opinion on a topic with supporting evidence while they say nothing, but take the time to insult. 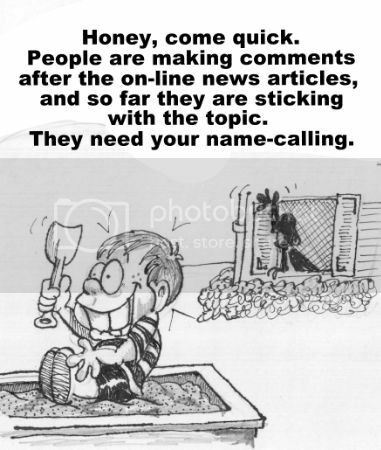 The purpose of blogs and political cartoons is to get people to think and debate a topic either to justify their own beliefs, convince others there is another way of looking at the same thing, or perhaps introduce information someone else may not have and which could influence their thinking, if not change their minds. I do not reply in the comments section as my opinion has been distilled before I have drawn the cartoon or written an accompanying commentary, so challenges, demands, or nicknames are wasted. And, believe me, with my past experience, nothing said in the comments can hold a candle to what I have heard before. And, even though I cannot control the comments, I do enjoy the ones that state an opinion and then offer facts so that other commenters can respond in kind.